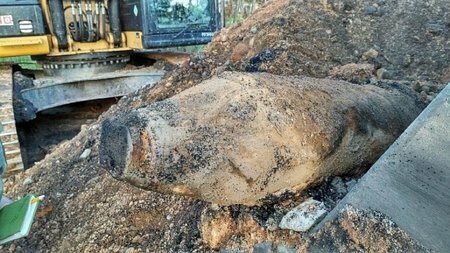 Grafenwoehr, Germany A 150-pound, WW II-era bomb was found on the construction site for a new school at the U.S. Army's Grafenwoehr Training Area. The discovery prompted an evacuation of residents living nearby and the closing of some roads in the area. Bedford, United Kingdom While digging in a garden, workers came across some unusual looking items. Not knowing exactly what the items were, they threw the items into a work-dumpster. However, believing the items had some historical value, one of the workers decided to save a few to show his friends and family over at the local pub. When the items were pulled out of the man's trunk at the local pub, the pub owner became concerned as he recognized them as potential UXO. He decided to send a picture of the ordnance to the police. 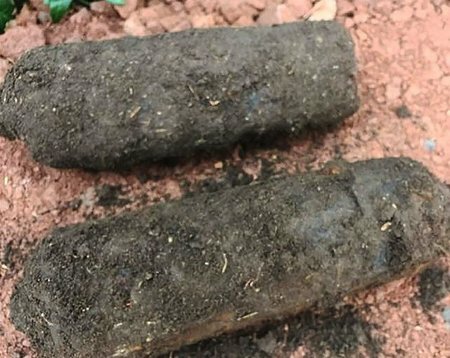 The pictures were passed along to a Northolt bomb squad, who responded to the site and confirmed that the unknown objects were indeed UXO. Fredericton, Canada Hazards from UXO are causing problems for firefighters on the military base at New Brunswick's Gagetown base where fires are believed to have started due to training activities involving munitions. The explosives safety threat from UXO in the area has prevented firefighters from going in on foot to combat fires effectively. A spokeswoman for the base has assured all concerned that the firefighters are ensuring that the fire cannot spread outside of the training area. In addition, she stated that alternative methods of combating the fire were being considered, including bringing in aircraft water tankers to fight the fire. Lincolnshire, England Royal Navy divers have recovered ten WWI mustard gas canisters from the bottom of Stixwould Lake in Lincolnshire. Specialists from Southern Diving Unit 2 in Portsmouth spent eight days in in the area of Woodhall Spa after canisters potentially containing mustard were found by two bottle diggers. The two received minor burns and respiratory problems which required hospital treatment after reportedly trying to dismantle the items. Following sonar mapping of the lake, divers put on chemical suits before entering the water to recover ten 6-pound canisters. The recovered were turned over to Lincolnshire Police, who are investigating how the items ended up in the area. Dorset, United Kingdom sailors aboard Merchant tanker ship, Skaw Provider, were surprised to find an old torpedo caught in the ship's anchor while raising the anchor from outside Portland Port. The flute of the anchor pierced the torpedo exposing the interior components of the ordnance. The ship's captain notified the Coast Guard who responded with technical support provided by an EOD team from the Royal Navy's Southern Diving Unit based in Portsmouth. Due to safety concerns from the UXO, the ship was evacuated of all non-essential personnel and fuel was pumped from the ship's tanks that were close to the torpedo before EOD began their operations. Devon, United Kingdom Construction workers dismantling a wall at a farmhouse made a startling discovery -- an exploded shell hidden in the wall. The workers notified the farm personnel who called the police. A Royal Navy bomb disposal team responded and transported the item to nearby field for proper disposal. The manager of the farm told Authorities that "the grandparents of the owners used to use the bomb as a door stop." She added that the wife of the former farmer "wanted it out of the way" and so "he buried it in the wall". The UXO was identified as a WWI era projectile. Berlin, Germany Approximately 10,000 people were evacuated from their homes in western Berlin after a 550-pound unexploded World War II-era bomb was discovered by construction workers. Authorities say it was a German bomb with a Russian detonator. Several city blocks were barricaded and trains stopped while the munition was safely defused.